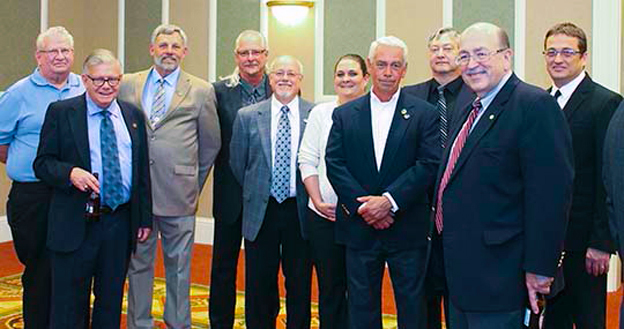 Alliance President Emeritus and former IAM International President George J. Kourpias, second from left, is joined by IAM International President Tom Buffenbarger, right, and current and past Iowa IAM leadership. The Iowa Alliance for Retired Americans honored Alliance President Emeritus and former IAM International President George J. Kourpias with its first annual George J. Kourpias Awards Dinner and ceremony in Altoona, IA. Kourpias, a native of Sioux City, IA, received an award in recognition of his exemplary and outstanding service to Iowa seniors. Kourpias served as the founding president of the Alliance for Retired Americans in 2001. During his tenure the Alliance’s membership grew to 3.5 million. The Iowa Alliance says it was an honor to give tribute to a great leader.